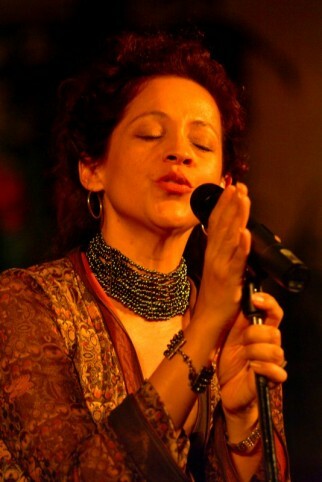 Grammy nominated vocalist, composer, and arranger Perla Batalla was born in Los Angeles, CA. Her father was a musician and owned a popular Spanish language record store. She first gained international attention as a backup singer for Leonard Cohen who later encouraged Perla to embark on a solo career. Perla released her debut “Perla Batalla” on the Warner/Discovery label in 1994. Not surprisingly, the critics loved it, calling her singing “sublime” and her talent “stunning”. Like many original artists, Perla opted to go independent, releasing her second album, “Mestiza” in 1998 on her own Mechuda Music label. An immediate favorite on Public Radio shows throughout the U.S. “Mestiza” was selected as Best Independent Release of the Year by Amazon.com. “Heaven and Earth” followed in 2000, along with a nod to Perla as Amazon’s Emerging Artist of the Year. Both “Mestiza” and “Heaven and Earth” celebrate a powerful civilization born from the explosive marriage of separate worlds. A resplendent, vibrant culture nourished by mysticism, imagery, magic and myth. Perla’s eagerly awaited follow-up to the “Mestiza” song cycle was an innovative undertaking of contagious rhythm and pure joy. Named for her parents record shop, the “Discoteca Batalla” project , was a compilation of original compositions interspersed with traditional Spanish language classics arranged to reflect Perla’s rich bicultural personal and musical heritage. Perla has taken the timeless songs heard growing up and molded their rhythmic and melodic forms to create a stunning cross-pollination of trend and tradition. “Discoteca Batalla” has appeared on “best of” lists throughout the country. Perla is excited about her tribute to Leonard Cohen entitled “Bird on the Wire”. The Album includes special guests such as; David Hidalgo (of Los Lobos), Bill Gable, Vinnie Coliauta, Greg Leisz, Julie Christensen and many other fine musicians. A collection of songs recorded after journeying to Buenos Aires to meet her mothers side of the family for the first time ever!